Join us for three days and two nights in scenic downtown Nashville, Indiana at Artists Colony Inn. In our time together, you will have the unique opportunity to hit the pause button on life as usual and intentionally invest in yourself and your practice. ​We'll create quality time and space where you can connect with your colleagues, reflect on the problems and possibilities within your practice, and take home ideas and inspiration to help you truly thrive. Whether you are currently struggling, stuck, or successful you'll receive the nourishment you need to fully flourish! Facilitated by Jacqueline Braeger, Scott Kahler & Laurie Budlong-Morse. Registration is now open! Learn more HERE. 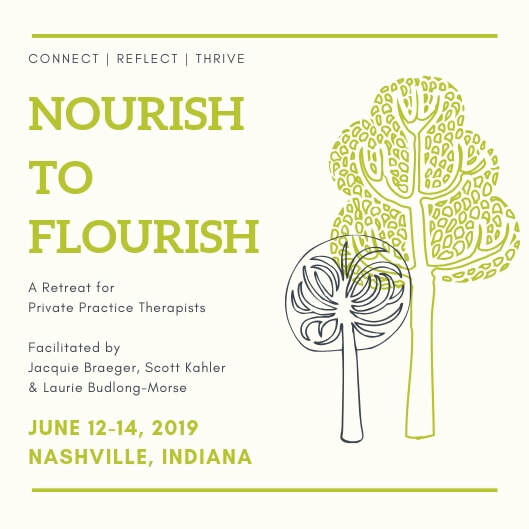 I'd like to learn more about the Nourish to Flourish Retreat for Private Practice Therapists! Please keep me in the loop.